Over the past few months, ELLE Brazil’s made headlines thanks to not one, but two blatantly pro-LGBTQ covers. Its July edition, fronted by transgender beauty Valentina Sampaio, received a standing ovation in our forums. Its August 2017 issue is another total hit. Daphne Groeneveld graces the positively electrifying cover. Photographed by Mark Abrahams, Daphne wears a feathered Calvin Klein number from Raf Simons’ debut collection. While we tire of the overused collection — it’s been featured on Vogue China, Vogue Italia AND Porter — everything from the lighting to the layout is on point. Hats off to ELLE Brazil for showing the more established fashion glossies how it’s truly done (again). Our forum members were similarly blown away. “She looks amazing. Love the cover,” raved thatsfierce. “Mark Abrahams is fantastic. He deserves bigger jobs!” held a thoroughly impressed DutchHomme. “Simply WOW! 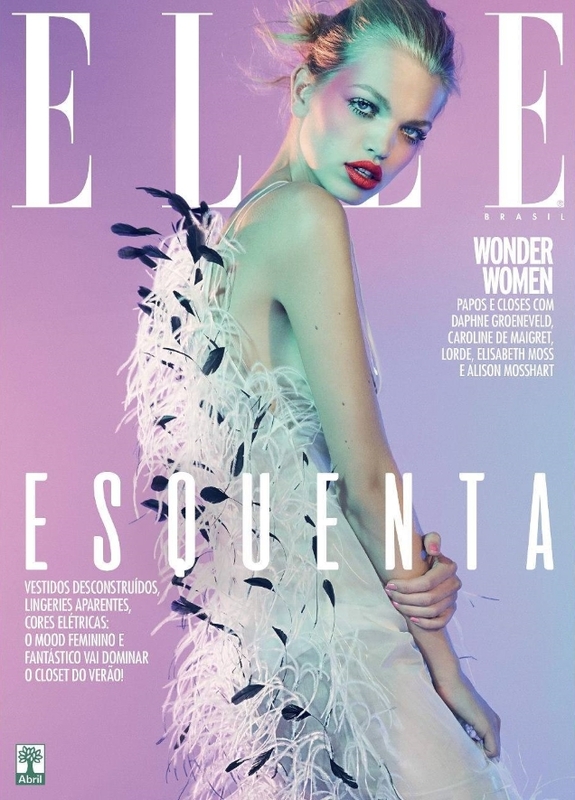 The ELLE Brazil team always make great cover choices. The cover is very fashion while still maintaining a mainstream appeal, and the white fonts really accentuate the other colors,” observed a delighted magsaddict. Also in agreement over how fantastic the cover turned out was dodencebt. “This is the best shot so far of those Calvin Klein dresses and Daphne looks gorgeous!” he affirmed. “Daphne deserves bigger success. She always produces great work but it’s always for smaller titles. This is excellent; someone get her back into Vogue!” 333101 pleaded. “I’ve never been a big Daphne fan, but this is absolutely stunning! Better than most Vogue covers I’ve seen this year,” admitted a pleasantly surprised [Piece Of Me]. “Amazing, looks like a Numéro cover,” commented forum member Vitamine W.
See more from Daphne’s cover story and join the conversation here.